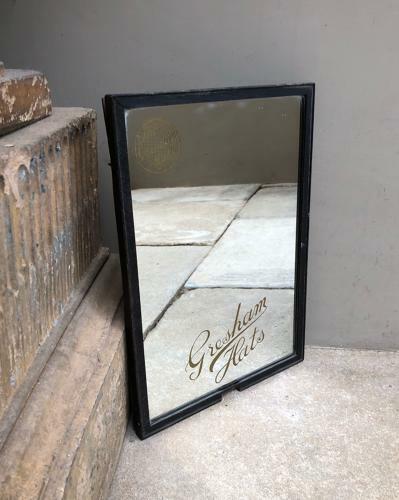 Wonderful ALL Original 1930s Haberdashery Shop's Advertising Mirror for "GRESHAM HATS". Reverse glass painted in its original thin black wooden frame, backing board and hooks to wall hang. The mirror has minimal foxing and is in excellent antique condition, the frame has had a small section cut out of the base could have been where a crest fitted it etc.. BUT I have offered as it is. I can have the little section filled and painted in to match or have it reframed in a very similar period style black frame - very easy to do - or you could do that.